Look what we found in the garage during spring cleaning! 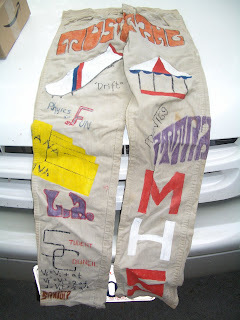 These are painted pants from my DH's high school days. His mother had saved them for all these years...look's like the 1960's to me! Quite remarkable. They are a much more interesting result than the warp painting I did at the Visalia conference. I took a class on Painted Warp with Jannie Taylor. I brought a warped loom to the class - warped with 20-2 perle cotton in a baby blue in a two shaft plain weave. Janie brought all sorts of textile paints, dyes, pens, markers, stencils etc. And we got to experiment on our warp. We tried different techniques to acheive different looks, explored the difference in application and effect of different dyes vs. diferent paints. Tried different types of paints including a whole slew of metallic ones. I especially liked the Sunset Gold metallic with the purple paint. It was great fun. To finish the piece, we had to iron it a bit then wait a week before washing. I was surprised when I took it out of the washing machine and it had not faded at all! All the colors including the dyes held fast. I selected the rice wine vinegar as my 'best' choice of what I had in the pantry. I made a small skein of the pink silk. I dropped a couple table spoons of vinegar into a glass with some 'hot water on tap' - it's automatically at 190 degrees right out of the faucet. I dropped the silk in and waited until it cooled to room temperature. Then for the fun part - I got to check if any color would come out. As long as there was vinegar on the yarn it held fast. I washed it out in cold water with soap. No color. Then warmed up the water and lo and behold - the color started coming out. It will be interesting to see if the over dye I did on this yarn will hold fast. That project is somewhat down the list of projects so it will be at least a month or so before I can say more. PS I have, since then bought some distilled white vinegar for future dyeing tests and experimentation. 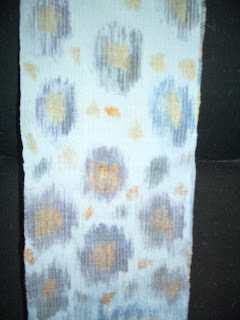 I bought some 7/2 silk in Visalia to play with Easy Ikat. Here are two of the silk cones I bought. I decided to throw them into my crock pot at low along with some other silk that I was preparing for dyeing. And low and behold - much to my chagrin the most of the pink and the green colors came out. Looks like I have some cones which lose their color at the warmer temperatures. I tested them in cold water and the colors were fast. Sara Lamb had mentioned she once bought some silk that did the very same thing. Oh well, so much for 'no planning' Easy Ikat... I will just have to add some steps to the process...first I need to test how much color will actually wash out. 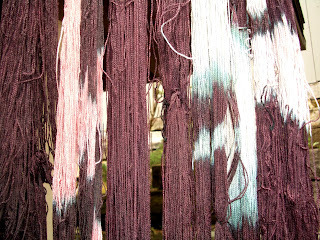 I will also need to test that if I over dye the resulting silk that those colors will remain fast. So here's the plan. First, I am going to test how much the colors are lost in different temperatures of water. I am going to tie up some of the silk in its original state with the plastic strips in a pattern of serendipity. Dye the skeins black. Come up with a design incorporating the black along with stripes of the six original colors I bought. I will weave three identical pieces using a bit of each color weft. Then throw one in hot, one in warm and one in cold water and see what happens to the colors. On the left below, is the skein that I tied, dyed black and untied. I used a cold batch dye method using soda ash. I already knew I would lose the color in hot water. Despite using the cold water method, it was surprising how much red washed out during the rinsing. 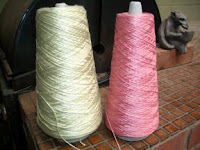 You can see how much less pink the dyed yarn is than on the cone. One never gets black when dyeing silk. The black used here pushed a deep purplish brown color which looks nice against the pink. I also dyed a skein plain black for stripes and weft. In the middle, is the skein which was originally green. On the right is the skein which was originally pink. They should made some interesting designs. PS all this was occurring as I cleaned out my studios, my closest, the den and the gym. I doubt I will make much more progress for awhile - at least until my studio is straightened and the yarn dry. Given the fog...it might be a long while.